Reprinted with permission from the July 28, 2017 edition of the New York Law Journal ©2017, ALM Media Properties, LLC. All rights reserved. Further duplication without permission is prohibited. For information, contact 877-257-3382 – reprints@alm.com or visit www.almreprints.com. 1. “Report on Statewide Attorney Discipline: Uniformity and Fairness,” N.Y.L.J., Oct. 23, 2015; “Fostering Efficiency in the Attorney Disciplinary Process,” N.Y.L.J., Jan. 21, 2016; “New Rules for Attorney Disciplinary Matters; Formal Proceedings,” N.Y.L.J., April 1, 2016; “New Rules for Attorney Disciplinary Matters: Informal Proceedings,” N.Y.L.J., Sept. 29, 2016; “New Rules for Attorney Disciplinary Matters: ‘Related Proceedings,'” N.Y.L.J., March 20, 2017. Reprinted with permission from the “March 16, 2017″ edition of the “New York Law Journal ©2016 ALM Media Properties, LLC. All rights reserved. Further duplication without permission is prohibited. For information, contact 877-257-3382 – reprints@alm.com or visit www.almreprints.com. 1. “Serious crimes” include felonies that lack felony analogs in New York, as well as misdemeanors with one or more of the elements listed in Judiciary Law §90(4)(d). 2. N.Y. Judiciary L. §90(4) provides, in pertinent part, that an attorney convicted of a serious crime “shall be suspended” until a final order of the appellate division ordering the attorney to show cause why a final order of suspension, censure or removal from office should not be made. However, “upon good cause shown” the appellate division may, “upon application of the attorney or on its own motion, set aside such suspension when it appears consistent with the maintenance of the integrity and honor of the profession, the protection of the public and the interest of justice.” N.Y. Judiciary L. §90(4)(f). 3. N.Y. Judiciary L. §468-A requires the biennial registration of all attorneys admitted in the State of New York. The attorney registration system is administered not by the appellate divisions, but by the Office of Court Administration (OCA). The registration fee is currently $375. See Hal R. Lieberman et al., “How Do I Get Back My Law License?,” NYLJ, Nov. 29, 2013. Reprinted with permission from the September 29, 2015 edition of the New York Law Journal © 2016 ALM Media Properties, LLC. All rights reserved. Further duplication without permission is prohibited. For information, contact 877-257-3382 – reprints@alm.com or visit www.almreprints.com. 1. Prior to the promulgation of the uniform rules, the First and Second Departments also issued Reprimands, which were “private” but did not constitute “informal discipline” because committees imposed Reprimands only after a hearing where the committee found misconduct in violation of an RPC. The committees no longer administer Reprimands under the uniform rules. Reprinted with permission from the April 1 edition of the New York Law Journal ©2016 ALM Media Properties, LLC. All rights reserved. Further duplication without permission is prohibited. For information, contact 877-257-3382 – reprints@alm.com or visit www.almreprints.com. Each Department of the Appellate Division shall appoint such Attorney Grievance Committee or Committees (hereinafter referred to as “Committee”) within its jurisdiction as it may deem appropriate. Each Committee shall be comprised of at least 21 members, of which no fewer than 3 members shall be non-lawyers. A lawyer member of a Committee shall be appointed to serve as Chairperson. All members of the Committee shall reside or maintain an office within the geographic jurisdiction of the Committee. Two-thirds of the membership of a Committee shall constitute a quorum for the conduct of business; all Committee action shall require the affirmative vote of at least a majority of the members present. 2. 22 N.Y.C.R.R. §1240.4 provides, in pertinent part, that two-thirds of the membership of a committee shall constitute a quorum for the conduct of business; all committee action shall require the affirmative vote of at least a majority of the members present. 3. 22 N.Y.C.R.R. §605.7(a) provides that, in the case of recommendations by the Office of Chief Counsel for formal proceedings, the committee chairperson shall designate at least two members of the policy committee, at least one of whom is a lawyer, to review the recommendations. 4. 22 N.Y.C.R.R. §691.4(h) and (i). 11. The uniform rules say nothing about plea bargaining before the filing of formal charges pursuant to §1240.8, but there is no logical reason any such bargaining cannot take place at an earlier stage. 17. See 22 N.Y.C.R.R. §605.14. 19. In fact, at least one of those courts has historically even discouraged reference to prior case law or recommendations from below on sanction. 23. Examples include: amended or supplemental pleadings are allowed only by leave of the court (22 N.Y.C.R.R. §1240.8(a)(1)), the court shall permit or require only such appearances as it deems necessary in each case (22 N.Y.C.R.R. §1240.8(a)(1)), statements of disputed and undisputed facts and law must be submitted to the court (22 N.Y.C.R.R. §1240.8(a)(2)), disclosure by both parties with respect to any disputed issue of fact must be provided “except as otherwise ordered by the Court” (22 N.Y.C.R.R. §1240.8(a)(3)), and all applications and motions are to be directed to the court (22 N.Y.C.R.R. §1240.8(c)). 24. See 22 N.Y.C.R.R. §806.5; 22 N.Y.C.R.R. §1022.20(d)(2). 25. See 22 N.Y.C.R.R. §605.13(p)(1). Reprinted with permission from the “January 21, 2016″ edition of the “New York Law Journal”© “2016” ALM Media Properties, LLC. All rights reserved. Further duplication without permission is prohibited. For information, contact 877-257-3382 – reprints@alm.com or visit www.almreprints.com. 1. The commission’s Report was released on Sept. 23, 2015. On Dec. 29, 2015, the Office of Court Administration announced the adoption of new uniform attorney discipline rules, promulgated as Part 1240 of the Rules of the Appellate Division, 22 NYCRR Part 1240, which will take effect on July 1, 2016. The new rules embody some, but not all, of the reforms recommended in the commission’s report. Subsequent columns will focus on the new rules. 2. There is no bright-line definition for “undue,” “unjustified,” or “unwarranted” delay. In essence, such terms generally reflect lengthy delays that cannot be explained by a corresponding complexity in the underlying matter. 3. To determine whether undue delay exists in the disciplinary process, the subcommittee considered: written submissions from numerous bar leaders, attorneys and legal services consumers; testimony received during hearings held by the commission; and, data collected from the four Departments with respect to disciplinary matters that resulted in a final order of sanction during the period 2012-2014. The average total days for all matters from the date of opening of an investigation through final order was 856 days. However, because the data the subcommittee received did not correlate the total time with the relative “complexity” of the underlying matters, the subcommittee was reluctant to conclude that the data established that “undue” delay exists, notwithstanding that the average total time was considerable. 4. Among the four Departments, only the First Department provides a procedure for intermediate administrative review of a referee’s report by designated hearing panels. Hearing panels have “the power and duty to review the referee’s report and recommendation and to make such determination as it may deem appropriate.” 22 NYCRR §605.22(2)(b)(1). After the referee issues a report and recommendation, the staff attorney and respondent have the opportunity to present oral argument and written submissions to the hearing panel. The hearing panel may then confirm, modify, or disaffirm the report and recommendation. 22 NYCRR §605.14(g)(1). 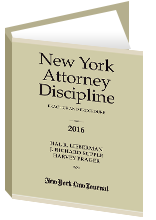 For a more detailed commentary, see Hal R. Lieberman, et al., New York Attorney Discipline: Practice and Procedure (New York Law Journal Books/ALM Media 2014) (updated for 2016). 5. Since 1986, and the landmark Court of Appeals case authorizing interim suspensions, Matter of Padilla, 67 N.Y.2d 440, 503 N.Y.S.2d 550 (1986), New York lawyers have been subject to suspension from practice on an interim basis, without formal charges and an evidentiary hearing, premised on proof of immediate danger to the bar and public. Evidence of such immediate danger can be shown in one of the following ways: (1) noncooperation with the disciplinary agency; (2) a substantial admission under oath that the attorney has committed an act of serious misconduct; (3) other uncontested evidence of serious professional misconduct; and, in the First Department only, an attorney’s willful failure or refusal to pay money owed to a client, which debt is demonstrated by an admission, a judgment, or other clear and convincing evidence. See 22 NYCRR §603.4(e) [First Department]; 22 NYCRR §691.4(l)(1) [Second Department]; 22 NYCRR §806.4(f) [Third Department]; 22 NYCRR §1022.20(d)(3)(d) [Fourth Department]. See also Hal R. Lieberman, et al., New York Attorney Discipline: Practice and Procedure (New York Law Journal Books/ALM Media 2014) (updated for 2016). 6. Although the courts did not adopt all of the commission’s recommendations, some of the newly adopted rules will foster efficiency in the attorney discipline process by the inclusion of provisions for notifying the accused lawyers earlier in the course of an investigation, opening new ways for lawyers to get information about their cases, granting greater latitude for “plea bargaining,” expanding opportunities for lawyers to be diverted into monitoring programs after complaints related to substance abuse, and terminating the First Department’s two tier hearing process that currently mandates review by hearing panels of hearing officers’ findings, conclusions and sanction recommendations. Reprinted with permission from the “October 23, 2015″ edition of the “New York Law Journal”© “2015” ALM Media Properties, LLC. All rights reserved. Further duplication without permission is prohibited. For information, contact 877-257-3382 – reprints@alm.com or visit www.almreprints.com. 1. Report of the Commission on Statewide Attorney Discipline, September 2015. 2. See Stephen Gillers, “Lowering the Bar: How Lawyer Discipline in New York Fails to Protect the Public,” 17 N.Y.U. J. Legis. & Pub. Pol’y 485 (2014). 3. Report at 47 (emphasis added). 4. See 22 NYCRR Parts 603, 605 [1st Dept. ]; 22 NYCRR Part 691 [2d Dept. ]; 22 NYCRR Part 806 [3d Dept. ]; 22 NYCRR Part 1022 [4th Dept.]. 6. Matter of Dunn, 22 N.Y.3d 699, 3 N.Y.S.3d 751 (2015). Is New York’s Disciplinary System Truly Broken? Reprinted with permission from the July 16, 2014 edition of the New York Law Journal ©2014 ALM Media Properties, LLC. All rights reserved. Further duplication without permission is prohibited. For information, contact 877-257-3382 – reprints@alm.com or visit www.almreprints.com. New York University Journal of Legislation and Public Policy, Vol. 17, #2 (June 18, 2014). __A.D. 3d __, 2014 N.Y. Slip Op. 04453 (1st Dept., June 17, 2014). The Second, Third, and Fourth Departments’ disciplinary procedural rules omit even the limited deadlines that the First Department’s rules contain. Judiciary Law §468-a is a statute requiring the biennial registration of every lawyer admitted to practice in New York. Attorney Discipline System: Does it Meet ‘Due Process’ Requirements? Hal R. Lieberman, “New York’s Attorney Discipline System: How Much Process Is ‘Due’?” NYLJ, April 4, 2012. Id. at 525 (citations omitted). In any case, an interimly suspended attorney would be well advised to request a prompt post-suspension hearing, if grounds exist, and in that regard should fully cooperate with the disciplinary investigation if prior non-cooperation contributed to the interim suspension. 118 A.D.2d 15 (1st Dept. 1986). See, e.g., Matter of Slater, 156 A.D.2d 89 (1st Dept. 1990); Matter of Ryan, 189 A.D.2d 96 (1st Dept. 1993); Matter of MacKenzie, 32 A.D.3d 189 (2d Dept. 2006); Matter of Klarer, 66 A.D.3d 247 (2d Dept. 2009); Matter of Capoccia, 272 A.D.2d 838 (3d Dept. 2000). Matter of Schwartz, 24 N.Y.2d 65 (1969). See Hal R. Lieberman, “Use of Collateral Estoppel in Attorney Disciplinary Proceedings,” NYLJ, July 27, 1998; see also Commissioner of the State Insurance Fund v. Low, 3 NY2d 590 (1958) (describing collateral estoppel as “essentially a rule of justice and fairness,” but one that can also be “elusive and difficult to apply”). Matter of Capoccia, 59 N.Y.2d 549 (1983); Matter of Friedman, 196 A.D.2d 280 (1st Dept. 1994). The respondent in Matter of Friedman petitioned the U.S. Supreme Court for a writ of certiorari, which the Court denied on Oct. 3, 1994. 513 U.S. 820 (1994).